I adore Thanksgiving. You do too, I bet. 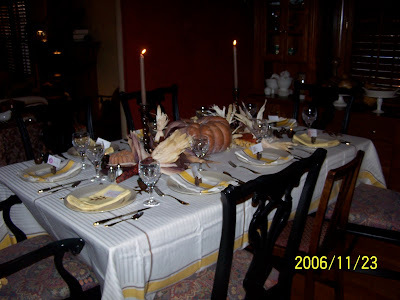 Of course I love the sentiment, the seasonality, the togetherness, the loving preparation of all of those sides dishes. But allow me to be superficial and Martha-y for a moment. I LOVE to set the table for Thanksgiving. I love the inspiration stage, the planning stage, the detailed execution. I do it days before the BIG DAY so I can enjoy it longer. All that crystal, all that linen, all that candlelight. (Okay, I don't like the ironing and pressing stage. Unlike my friend Sunshine who does. Something is wrong with her, but I love her anyway. I'm just full of love today, aren't I?) I think about it all year. Rustic or formal? What colors? What can I put to use from the garden? What place settings? What place cards? And on and on ad nauseum. Sometimes I do workshops on this topic alone. 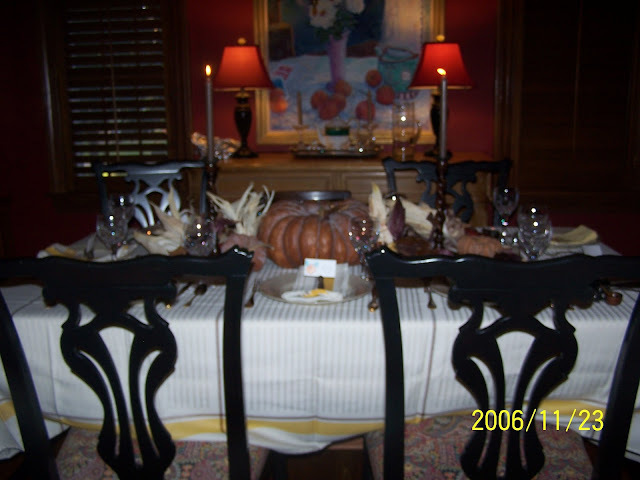 Did I say I LOVE a beautiful table at Thanksgiving? Oh, and the matching little satellite tables too when the crowd is large. 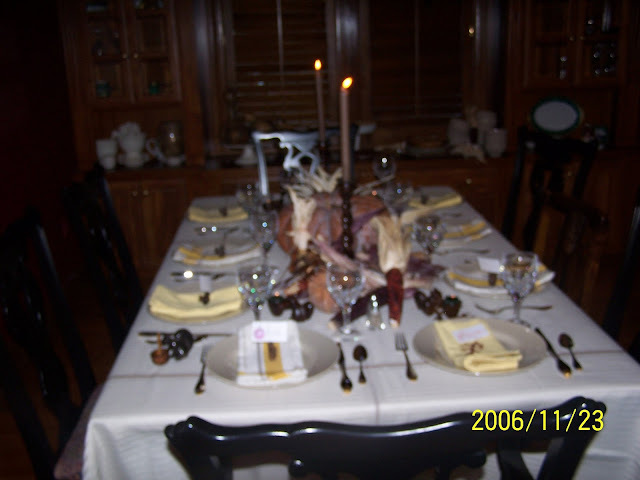 Here's a Thanksgiving table tableau for you, my dears. All mixed up. Images from past years and this year as well. Some of them not very clear. I didn't even bother to take the dates off the pics. I thought you might enjoy that. 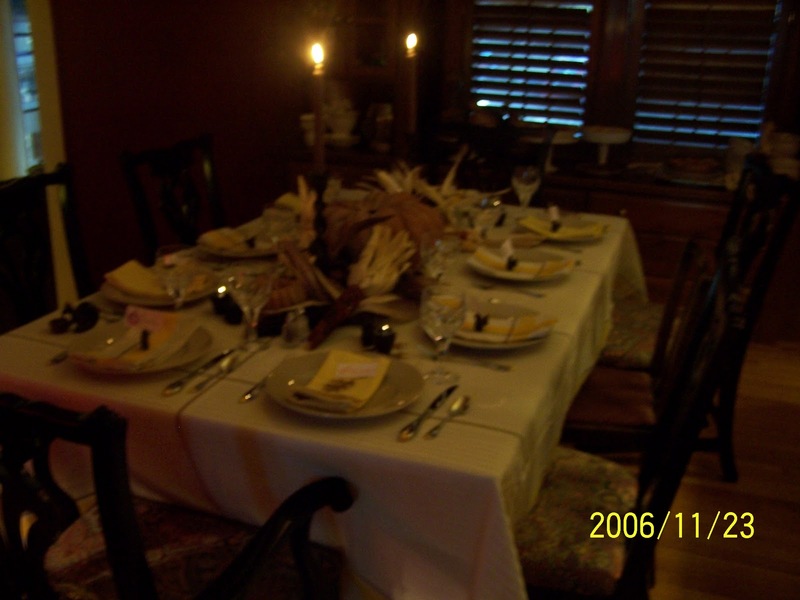 The white linen, malachite green china, gold leaf with sweet little homemade leafy place cards, centerpiece with kale and coneflower (breathe) is this year. Let me know which you like best, won't you? P O T A G E R.
p.s. Just for the record, I'm listening to the local news now, and I don't think earthquakes and tornado watches in OKC are very Thanksgiving-y. I'm just sayin'.